Russian-led forces have mounted eight attacks on Ukrainian troops in Donbas in the past 24 hours with no casualties reported, the press centre of the Joint Forces Operation (JFO) has reported. "The ceasefire was breached eight times, including thrice by use of weapons prohibited by the Minsk Agreements. ... None of the Joint Forces' servicemen was hurt," the press center wrote on Facebook on Wednesday morning. The press center reported attacks on Ukrainian positions near Avdiyivka, Bohdanivka, Hnutove, Novomykhailivka, Krymske, Katerynivka, Luhanske, and Khutir Vilny. According to Ukrainian intelligence, on January 29, four militants were killed, another six were injured. What is more, the Ukrainian troops destroyed a KAMAZ military truck with weapons and equipment belonging to the enemy. 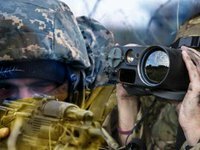 In addition, the Ukrainian military spotted and eliminated an enemy ambush during a reconnaissance operation near the town of Dokuchaievsk. They seized a 120mm 9K111 Fagot anti-tank missile system, an RPG-18 anti-tank rocket launcher, and a 12.7mm NSV (Utyos) heavy machine gun.